SHEAR ILLUSIONS WAFUNGUA DUKA LA JUMLA KWA AJILI YA MADUKA YA REJAREJA...!!!! Dearest customers, we invite you to our welcome party on Friday, April 20, 2012 at the LAPF Millenium Towers, 1st Floor, Kijitonyama. 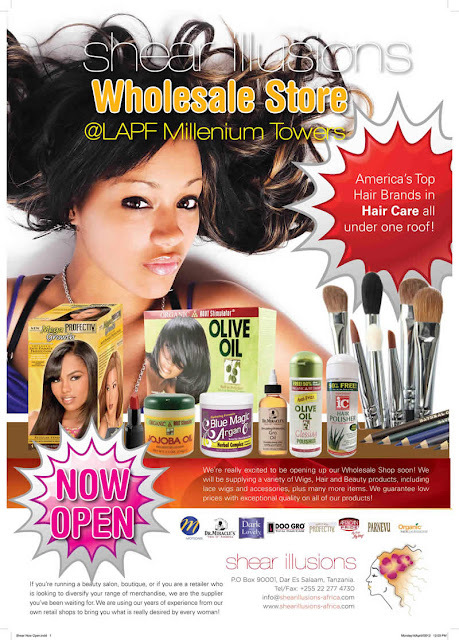 Our wholesale store will resume business from 11:00am to 4:00pm. We highly appreciate your support. Come one, come all.